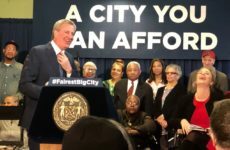 The Betances Houses in Mott Haven as of Friday are no longer Section 9 public housing, Mayor Bill de Blasio announced at a press conference at the complex on Monday. Over the next two years, de Blasio said, the buildings will undergo major renovations to bathrooms, kitchens, flooring, roofing and boilers. NYCHA signed away a 99-year ground lease to Wavecrest Management Company which will run the day-to-day of the building, and partner with MDG Construction to make renovations. Catholic Charities will also be running social services for the development, he said. De Blasio assured that no residents would be displaced. 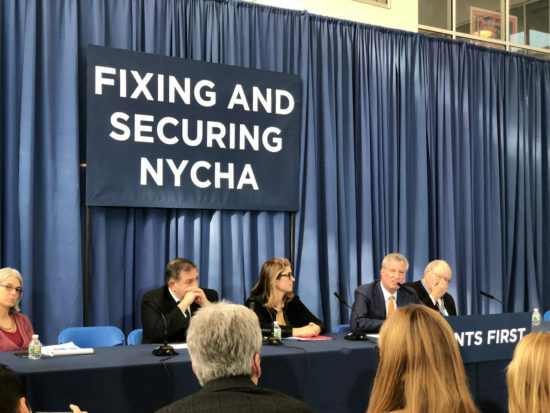 The mayor’s appearance comes five days after federal judge William H. Pauley III rejected a settlement that would have required the city to allocate an additional $1.2 billion in NYCHA repairs. The mayor said despite the ruling, NYCHA plans to renovate 62,000 units with RAD funding by 2028 — a $12.8 billion investment. 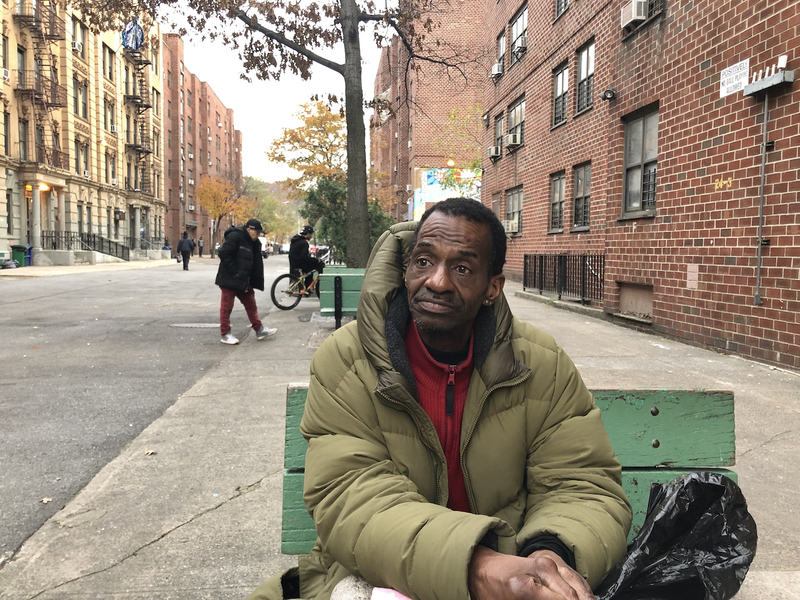 But Danny Barber, chair of the NYCHA Tenant Association presidents, has a different title for RAD: “Residents Always Displaced.” Barber says that RAD puts tenants at Betances at risk. 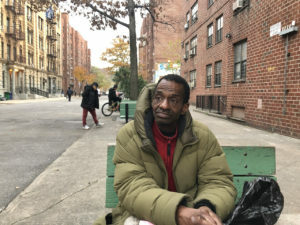 Barber said he is concerned that tenants won’t be able to organize with the larger group of NYCHA tenant associations, and thus will lose a lot of their power as control over the buildings fall to developers. He said he doesn’t believe that de Blasio will be able to keep his promise of keeping a fixed rent for residents. Barber doesn’t have much faith in Wavecrest either. 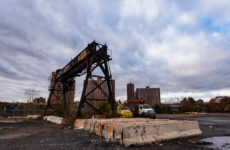 In the past, Mott Haven tenants have complained about the management company’s deteriorating buildings and lack of response to tenants’ demands. Last year, a developer dropped Wavecrest as management for a residential tower on Concourse after backlash. But once the RAD conversion was official on Friday, Wavecrest began painting the walls of units and cleaning the floors. MDG site supervisor Rick Newton said that larger construction will begin the second week of January. Bathrooms will be the first round of renovations. Things like boilers and roofing will have to wait until the spring, he said. He said residents will mostly stay in their homes as the teams work on renovating each unit. Wavecrest will have 30 employees at Betances, including two trash collectors, said the company’s general manager Yesenia Matamoros. 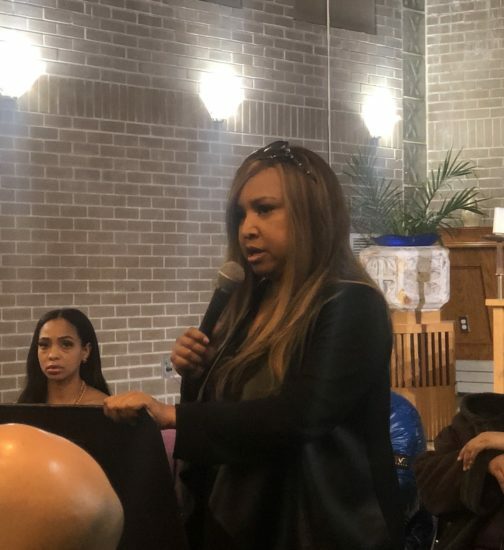 She also said that Sanitation Salvage, NYCHA’s trash hauler, will no longer pick up at the scatter site. Instead, the Department of Sanitation will pick up bins at centralized locations and do curbside pickup for certain buildings. Resident Michael Jenkins, 58, said Betances has been cleaner since the conversion, but he’s unsure if the upkeep will last.